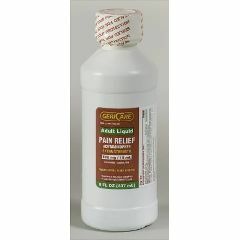 Acetaminophen Liquid 500MG 8oz is a Non-Asprin (Acetaminophen) Pain Reliever 500MG. Quick relief of pain. Love it is in liquid form. My 20 year old son has trouble swallowing pills. He has a wrist injury that flares up every now and then. Love that this product is available in liquid form, it gives him the relief he needs. Is the liquid acetaminophen dye free?